Homestead living with modern amenities. 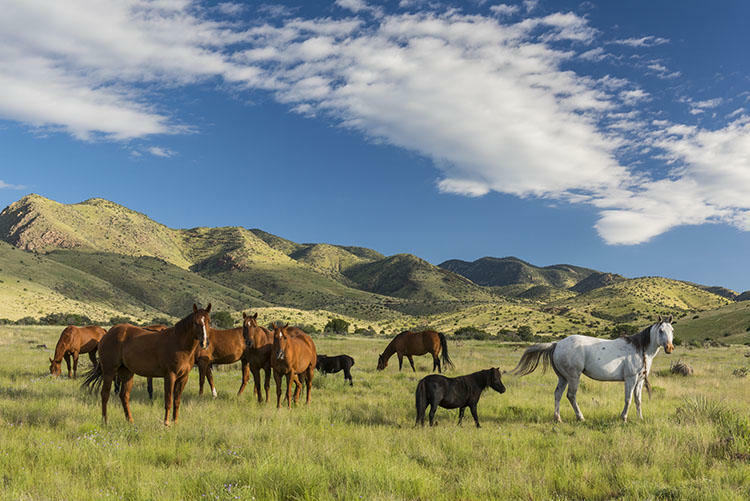 Originally part of a historic Spanish land grant, Highland Springs Ranch, abutting the Bosque del Apache National Wildlife Refuge, now offers 20- and 160-acre spreads to those who dream of peaceful living amid great scenery. The Brooks Companies welcomes anyone looking to invest in property, create the perfect summer getaway, or retire to homestead living. Just a half-hour from Socorro, and less than two hours from Albuquerque, Highland Springs sits tantalizingly close to Elephant Butte Lake. Lieutenant don Pedro Armendaris of the royal Spanish army first owned the land in the early 19th century, and his heirs later grazed cattle upon it. Of Highland Springs’ nearly 900 parcels, about 700 have sold, and a homeowners’ association maintains the quiet, dirt roads. With its temperate climate and room to roam, Highland Springs just might be the answer to your American dream. Tempted? Listen to Alan Olson, manager of Highland Springs Ranch. Above: Ranch horses roam in the open areas. Photograph courtesy of the Highland Springs Ranch. Q: WHAT DO YOU LOVE ABOUT HIGHLAND SPRINGS? AO: This part of New Mexico is absolutely stunning. We sit in a little valley between the Magdalena and Chupadera mountains, and you look across the property to the Río Grande. The region has some really cool history. We’re right across from Black Mesa, where there was a Civil War battle, the Navajos’ Long Walk passed nearby. and because it was a land grant, it’s unique even to the United States. AO: Birdwatchers and people who love wildlife—the national wildlife refuge is part of the neighborhood! A lot of people just want to get away and get off the grid, and we offer that opportunity to unplug and be away from it all. About 15 people have homes and live year-round on the property. Others come out for summers, and quite a few have put up a shed or barn, park their RV, and use it as a getaway. A large chunk of our buyers are looking at it as an investment property, and we have some who hope to retire on it later in life. AO: We have three subdivisions comprising about 802 20-acre parcels, and we also have 94 parcels of about 160 acres. It’s a nice place to get away. AO: Because of our altitude, it doesn’t get as hot in the summer or as cold in the winter as other places in the Southwest. It’s a nice place to be if you’re trying to get away from the harsh winters in the Northeast or the heat of a Phoenix summer. Q: IS IT STILL A RANCH? AO: We still have cattle being run on the ranch, but not to the scale that it did in the past. Our salesman on the ranch is one of the property owners, and he runs cattle, as well. That’s great for the land, because responsible grazing helps keep the vegetation at a level where it doesn’t get out of control, it helps reduce fire, and it gives all the landowners who don’t fence their property a tax exemption. Q: SOUNDS GREAT. WHERE DO I SIGN UP? AO: Call 877-273-8868 for more details. 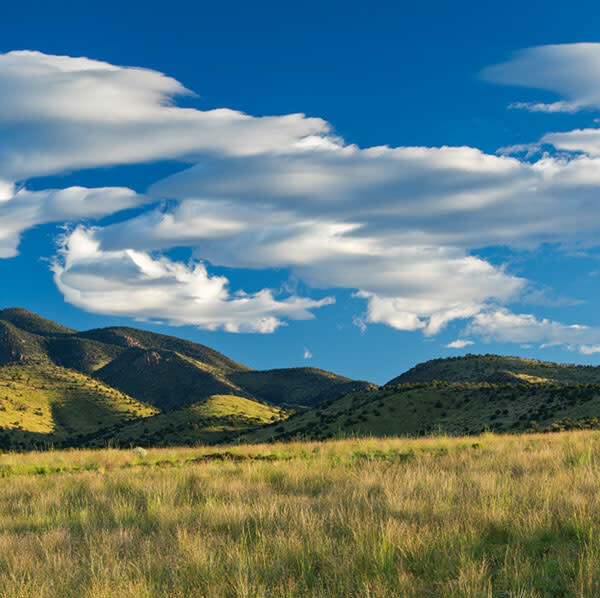 For more information on buying your slice of New Mexico, check out the Highland Springs Ranch site.